The French Revolution was the most bloody, chaotic, and destructive political upheaval of the so-called Enlightenment era. 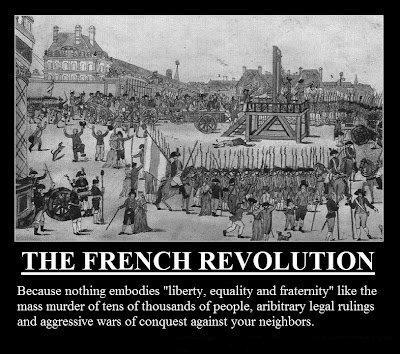 Spurred on by the resentment, envy, jealousy and impiety of the have-nots against the so-called nobility of France, and led by a sociopathic assortment of ideologically inconsistent leaders, the end result of the French Revolution was the summary execution of thousands of the new regime’s imaginary opponents (including many of the original leaders of the very revolution itself! ), the wide scale attack against anything that was even suspected of reflecting a religious or spiritual mindset, the destruction of traditional French culture, and the rapid ascendency of atheism, hedonism, and imperialism that eradicated all freedoms in the very name of liberté. The French Revolution was the ultimate triumph of the, heretofore only symptomatic, successful ascendency of the perennial revolt against Natural Law all too often witnessed in the annals of the human history of the Kali Yuga. As Dharma Nationalists, we obviously reject the failed atheistic ideology of the French Revolution. This entry was posted on Saturday, July 7th, 2012 at 4:37 pm	and tagged with atheism, counter revolution, dharma manifesto, dharma nation, enlightenment, french revolution, guillotine, illuminati, sanatana dharma, tyranny, vedic and posted in Outreach Tools. You can follow any responses to this entry through the RSS 2.0 feed.